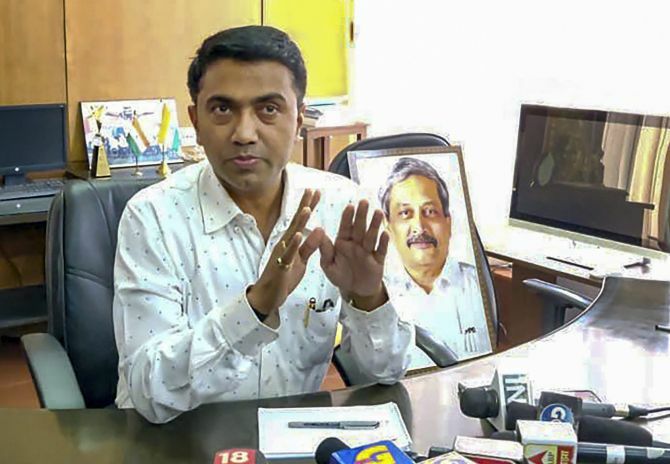 The new Bharatiya Janata Party-led government in Goa will face the floor test on Wednesday, to prove its majority just a day after Speaker Pramod Sawant was sworn in as chief minister with an unprecedented two deputies past midnight capping a frenetic day of political wrangling. The government claims majority with the support of 21 MLAs--12 from the BJP, three each of allies Goa Forward Party and Maharashtrawadi Gomantak Party and three Independents. The strength of the 40-member House has been reduced to 36 following the death of Chief Minister Manohar Parrikar and BJP MLA Francis D'Souza and resignations of two Congress MLAs Subhash Shirodkar and Dayanand Sopte. The Congress, which is the single largest party with 14 MLAs, had also staked claim to form the government. There is also a Nationalist Congress Party legislator in the House. Governor Mridula Sinha has convened a special session of the assembly at 11.30 am on Wednesday to enable the chief minister to prove his majority in the House, an official said. The new BJP-led government in Goa will face the floor test in the state Assembly on Wednesday to prove its majority just a day after Speaker Pramod Sawant was sworn in as chief minister with an unprecedented two deputies past midnight capping a frenetic day of political wrangling. Governor Mridula Sinha has convened a special session of the Assembly at 11.30 am Wednesday to enable the chief Minister to prove his majority in the House, an official said. After multiple postponements of the oath ceremony on Monday, Sawant, a two-time MLA from Sankhalim in North Goa, was sworn in at the Raj Bhavan at 1.50 am. An ayurveda practitioner, Sawant is a dedicated Rashtriya Swayamsevak Sangh worker. Reflecting a generational shift in the BJP, Sawant, 45, was administered the oath of office and secrecy along with 11 other ministers including those from the MGP and the GFP. He succeeded Parrikar, who died on Sunday after battling pancreatic cancer for over a year. Interestingly, all the ministers who were part of the Parrikar Cabinet were sworn in by the Governor. As per the power-sharing arrangement reached by the BJP with allies, an MLA each from the two smaller parties backing the saffron party--GFP chief Vijai Sardesai and MGP's Sudin Dhavalikar--were made deputy chief minister. It is for the first time that a tiny state like Goa has two deputy chief ministers. Besides Sawant, Sardesai and Dhavalikar, the others who were sworn in were Mauvin Godinho, Vishwajit Rane, Milind Naik and Nilesh Cabral(all BJP), Palekar and Jayesh Salgaonkar(both GFP), Manohar Ajgaonkar(MGP) and Independent MLAs Rohan Khaunte and Govind Gawade. Sawant said the new government had sought a floor test on Wednesday to prove its strength in the assembly. He exuded confidence that the BJP-led alliance would win the floor test and remain intact, adding the party's allies are backing him. "I will try to ensure that the alliance remains intact. I will deal with people the way Parrikar used to," Sawant said expressing confidence that his government will complete its tenure. He said ministers sworn along with him would be allocated portfolios soon. BJP president Amit Shah and Union minister Nitin Gadkari played a critical behind-the-scene role in ensuring that the party retained power in Goa, sources familiar with the developments said. The impasse over government formation, which included dealing with stubborn allies wanting to extract their pound of flesh, was resolved with deft handling of the situation by the two senior BJP leaders, party sources said. Sawant said his priority was to complete projects undertaken by Parrikar. The state government will build a memorial in Parrikar's name at Panaji's Miramar beach, where he was cremated, he added.